Look to the right, and you will see Cliff Nielsen and his first Weimaraner (Doc) pictured to the right. Doc was raised by Uncle Clifton Nielsen, and given to Cliff as a gift. 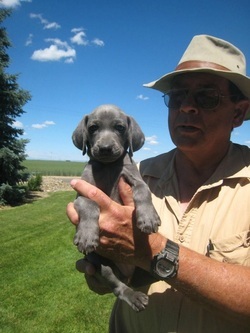 Below, fifty years later, Cliff holds up a (OwyheeStar) Blue Weimaraner pup. "Doc" left a giant paw-print impression on Cliff's heart. 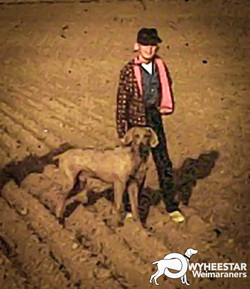 Founded from a passion born in young boy's heart and soul, OwyheeStar is located on the Nielsen family farm; south of Ontario, Oregon. It seems appropriate that OwyheeStar is located in the Treasure Valley, when so many people treasure their OwyheeStar family member. Cliff and Shela work together; making it their business to share their knowledge, experience, and passion for the Weimaraner. The world has changed a lot since Cliff met his first Weim. Some things have not changed, one being the Weimaraner. Isn't it nice to take comfort in the special relationship the Weimaraner forges with their humans. The passion grew with intensity, and in time Cliff and Shela added the Blue; and now the Longhair Weimaraner. They embrace all things Weimaraner. OwyheeStar does not raise any other breed. They are all about the Weimaraner. For the last twenty years, OwyheeStar has gone about the business of raising a few Weims, and carefully placing them in selective homes. Cliff has hunt-tested a few, and trained quite a few. Early in their rekindled obsession, Cliff and Shela found themselves rescuing as many as they could, and rehabilitating them. As the demand grew, the idea of rescue became impossible. Today, they focus on taking care of the Weims; however, the Weims say own Cliff and Shela, The OwyheeStar clients who have become more than a person who bought a Weim, also get some attention. Shela writes and publishes The OwyheeStar Weimaraner's News Blog daily. If you wish to learn more about Cliff and Shela, their Weims, the pups they have raised, or the Weimaraner in general we suggest you subscribe to the blog. Click Here to visit the blog.